CB and I first came across caramel ribs when we celebrated her new job by going to Pitt Cue Co and stuffing ourselves silly with meat, bone marrow mash and trendy bourbon based cocktails. The tender ribs were smothered with this delicious sweet sticky sauce which was (thankfully) nothing like BBQ sauce and everything like little bites of porky heaven. The choice of beer should be personal. CB and I spent more time than was really wise arguing over different kinds of craft beers but all this really needs is a beer with flavour. We went for a Leffe in the end and it was delicious but we plan to try it with Guinness next time for an interesting and darker flavour. Unfortunately we were making this up as we went along and stumbled upon the best serving suggestion by chance. We still had loads of brioche buns leftover from the basil pancakes we made the weekend before and decided to take these to the party, along with a coleslaw which was so garlicky, it made my eyes water with joy. The recipe for that will follow another time. By the time the meat has finished cooking, it’ll be falling off the bone. Stuff this gleefully into the bun, top it with a scoop of your favourite coleslaw and then jam it straight into your mouth. Wash down with your favourite beer. Adapted from this David Lebovitz recipe. 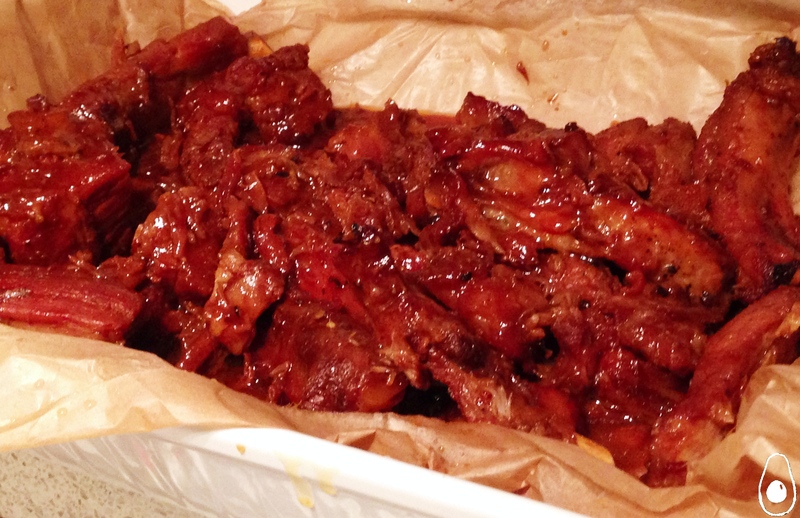 About 2kg of your favourite pork ribs. I personally prefer spare ribs with the meaty tips left on. I got these from the meat counter at my closest major supermarket. Pre-heat the oven to 180 degrees celsius. 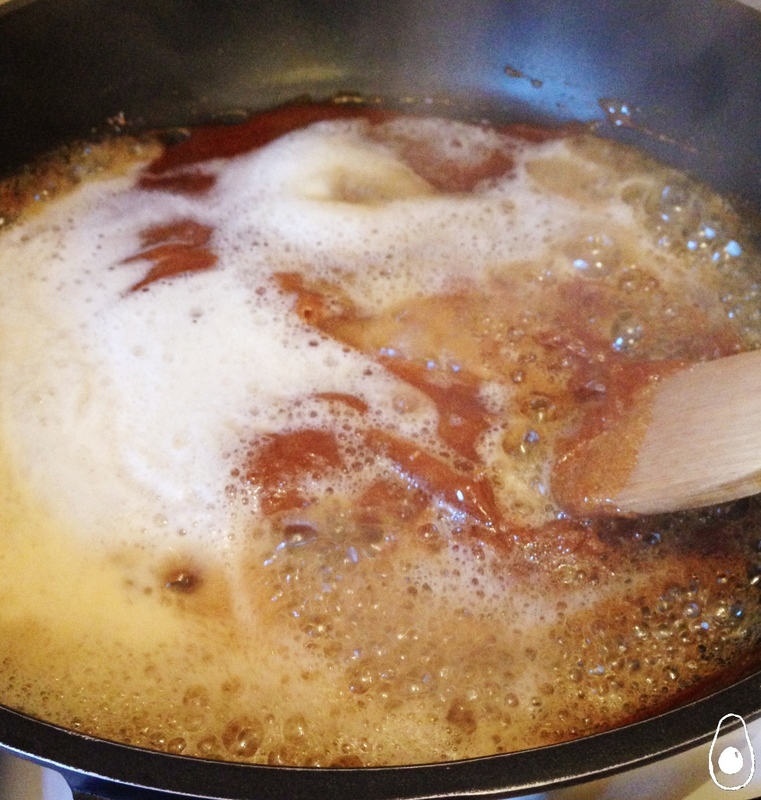 On the hob, spread the white sugar evenly at the bottom of an oven safe casserole pot and heat it slowly on a medium heat until it melts and turns into caramel. Try not to stir it too often. It’s done when it’s a deep bronze colour but make sure you don’t burn it. Turn the heat right down to its lowest setting and add the beer. It will boil up vigorously and then seize. Don’t panic. 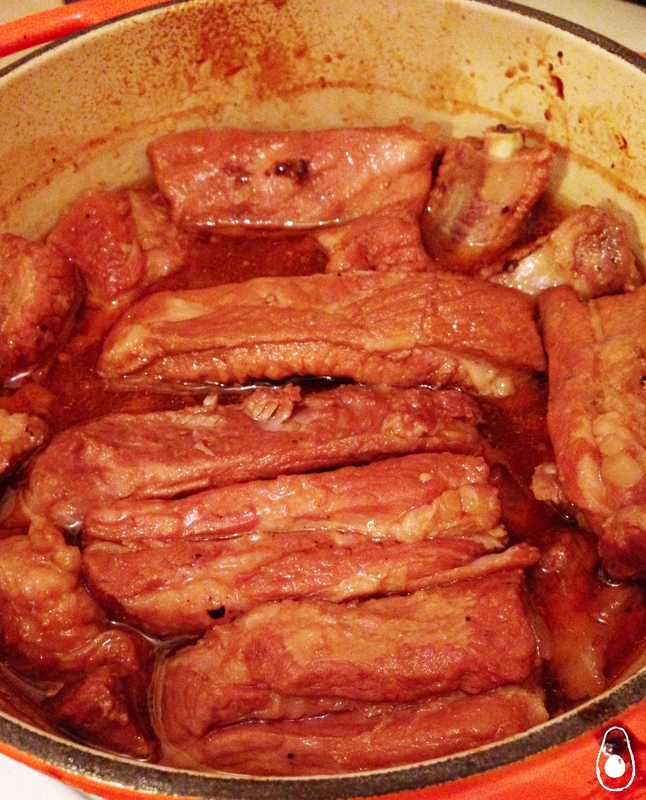 Add the rest of the ingredients except the ribs and stir to ensure that all the caramel stays soft. Add the ribs, shifting them around to ensure they are as far submerged in the liquid as possible. Put the lid on the casserole pot and put the whole thing in the oven and roast for 2.5 hours, taking it out to turn the meat 3 or 4 times throughout. Pour the ribs and all the juices into a shallow, wide lasagne dish lined with baking paper and continue to roast at 200 degrees celsius until the sauce is thickened and totally glazes the meat. Devour with a simple coleslaw and brioche buns or, for something more substantial, try garlic mashed potatoes. Sharing this one with our pals at Angie’s Fiesta Friday – almost a year old, can’t believe it! I would love porky heaven too! I love ribs and these ribs look delicious. Oh gosh. I read that as ‘Camel’ Ribs at first. Having such a dyslexic day today. Nonetheless, delicious!